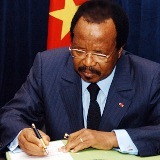 President Biya has ordered the special recruitment of 80 Cameroon Anglophones into the National School of Administration and Magistracy known by its French acronym as ENAM. The Minister of Public Service and Administrative Reforms, Michel Ange Angouing, broke the news in a press release issued Monday, May 15. The release states that a competitive examination has been launched for the recruitmentof 50 justice auditors and 30 court registrars of English expression into ENAM for the 2017/2018 academic year. The competitive examination will be written exclusively in English in Bamenda, Buea, Yaounde and Garoua centres. It reveals that another special recruitment exercise will be launched for English-speaking Cameroonians in the days ahead to enable more Anglophones to get into the Magistracy, Registry, Administrative and Financial Divisionsof ENAM. Minister Ange Angouing also issued the release in his capacity as the chairperson of the adhoc committee incharge of the special recruitment of Anglophones into the judiciary section of ENAM in order to take care of the shortage of magistrates in the Northwest and Southwest Courts of Appeal. The adhoc committee has a three-year mandate from 2017 to 2020. The special recruitment is President Biya’s bid of reversing the scandal whereby Francophone magistrates who do not master English are sent to work in the common law jurisdictions in the Northwest and Southwest Regions. The recruitment of justice auditors is to enable Anglophones have a good place at the Audit Bench of the Supreme Court. For one thing, the special recruitment is Government’s response to one of the grievances of the Common Law lawyers. Such grievances culminated in a strike that has kept lawyers away from the courts in the Southwest and Northwest Regions since November last year. The lawyers took exception to the situation wherein magistrates of Civil Law origin were posted to the common law jurisdictions of the two Anglophone regions. This explains why Biya instructed the Minister of State in charge of Justice and Keeper of the Seals, Laurent Esso, to take special measures to address the situation. It was because of this that Esso announced via a press conference at the end of March the creation of common law departments at the Supreme Court and ENAM. Away from the special recruitment of Cameroon Anglophones, it is not known if the citizens of the Northwest and Southwest origin will be given due attention during the general competitive entrance examination into ENAM that has already been launched. Over the past decades, few Anglophones have succeeded to be recruited into ENAM. For one thing, the entrance examination was set entirely in French which many Anglophone candidates did not master. Such a situation, coupled with the fraud that usually characterises the examination, made ENAM look like the preserve for Francophones.